Dr Ken Noble, the Director of Noble-Soft Systems and the owner of the ANSWER software, who previously announced that he would retire at the end of 2017, has reached an agreement with ETSAP under which he will now retire at the end of 2018. From 1 March 2017, Ken’s email address has been ken@noblesoft.com.au (replacing his previous email address of noblesoft@netspeed.com.au). For details of the implications for existing and potential new ANSWER-TIMES users of Ken’s retirement, see under Latest News on the ANSWER-TIMES tab. Likewise for details of the implications for existing and potential new ANSWER-MARKAL users of Ken’s retirement, see under Latest News on the ANSWER-MARKAL tab. Noble-Soft Systems is an Australian software development company established in 2003 that focuses on supporting and developing the ANSWER software which is used in over 100 institutions around the world by energy policy analysts working with the MARKAL and TIMES energy system models. The MARKAL and TIMES models were developed by the International Energy Agency’s Energy Technology Systems Analysis Programme (IEA-ETSAP). For information about IEA-ETSAP and the MARKAL and TIMES energy models see www.iea-etsap.org and www.iea-etsap.org/web/tools.asp. Dr Ken Noble is the Director of Noble-Soft Systems. Ken has a Ph.D. in Applied Mathematics from the University of Adelaide and a Graduate Diploma in Computing from the University of Canberra. Ken first worked with MARKAL (the OMNI version) during 1992 and has had an active involvement with the ETSAP community, MARKAL and TIMES since 1993. 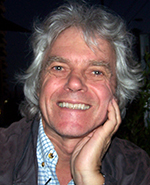 Ken developed ANSWER-MARKAL, the first Windows-based interface for working with MARKAL, while working for former Australian ETSAP Partner ABARE. In 2003 Ken established Noble-Soft Systems and became the owner of the ANSWER software, thereby ensuring its continuing development and support. ANSWER-MARKAL, the first Windows-based software for working with ETSAP’s MARKAL model, became available in 1998, has been extensively enhanced over the past 15 years, and is used by nearly all of the world’s MARKAL modellers. The ANSWER-TIMES software for working with ETSAP’s newer TIMES model became available in 2008, has been extensively enhanced since then, and continues to undergo enhancement. The ANSWER interface EXE provides facilities for data entry/edit/browse, for initiation of a TIMES or MARKAL GAMS model run, and for results handling. Model data is stored in a Microsoft Access database, with “smart” Excel spreadsheets provided to expedite the preparation and bulk-loading of model data into the ANSWER Access database. After completion of the TIMES or MARKAL GAMS model run, results from the model run can be brought back into the ANSWER database and browsed online. Since both ANSWER variants have very similar mechanics of operation, existing ANSWER-MARKAL users who choose ANSWER-TIMES to work with TIMES will already be familiar with the operation of ANSWER and can focus on the differences between TIMES and MARKAL. Data and assumptions are entered into the ANSWER database manually using the ANSWER-TIMES EXE, or by bulk-loading model data from “smart” Excel spreadsheets. Model run initiation from ANSWER causes the creation of text files (in GAMS format) specifying the model instance to be solved by the TIMES (MARKAL) GAMS code. The TIMES (MARKAL) GAMS run produces as output text files containing model results: two sets of results text files can be produced, one for import into ANSWER and the other for import into VEDA-BE. This provides maximum results handling flexibility to the user. For detailed information regarding ANSWER-TIMES or ANSWER-MARKAL, click on their respective tabs. 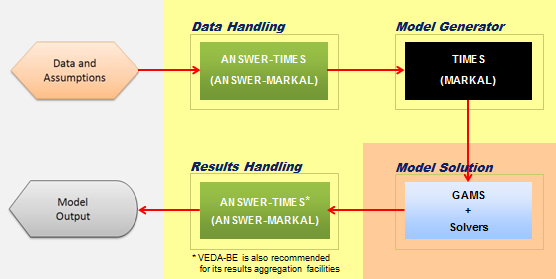 Information about the VEDA-BE results handling software that is recommended for use in conjunction with ANSWER-TIMES is available below the “Overview of the ANSWER-TIMES system …” diagram in the “Main Features” section under the ANSWER-TIMES tab. A particular ambition for ANSWER is that it provide user-friendly software with a gentle learning curve and where the software itself has considerable in-built knowledge of the particular energy system model (TIMES or MARKAL) being used, to maximize assistance to the user. While this ambition has been substantially achieved for MARKAL by the ANSWER-MARKAL software, the ANSWER-TIMES software continues to undergo enhancement to improve its in-built knowledge of the TIMES model, and of course to incorporate support for new TIMES features as they are developed by ETSAP. An important aspect of ANSWER’s user-friendliness is the provision of comprehensive documentation of ANSWER’s facilities. For details see “Documentation” under each of the ANSWER-TIMES and ANSWER-MARKAL tabs. The standard version of the ANSWER software has not been explicitly engineered to handle extremely large multi-region models, but is nonetheless being used by some clients to work with quite large-scale multi-region models (10 or more regions with 1,500 or more technologies per region). ANSWER’s user-friendliness and gentle learning curve make it an excellent choice for working with models ranging from single-region to quite large-scale multi-region models. A special “Library Region” version of the ANSWER software has been developed that is explicitly engineered to handle very large multi-region models, and is being used by the International Energy Agency for their TIMES-ETP model.